For dirt oriented dual sports where weight and size considerations are paramount. SU Selection: Please specify the correct SU side rack for your V-Strom 650 by indicating the year below. 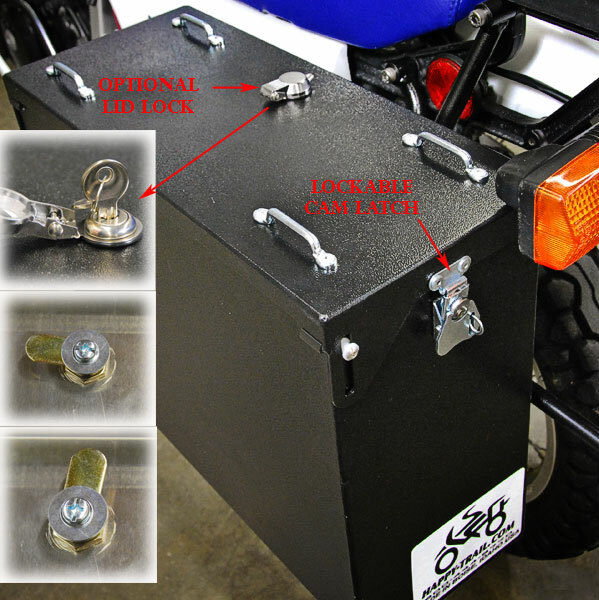 Pannier kits include: Each and every pannier kit includes the SU Rack and the Puck Mount kit. Additionally, kits include Free pre-mount and Free lid locks. Make your additional selections below. Bag-It! Add four pannier liner bags for the bundled price of $60 (save $20.) Stack one Canyon-Cut bottom bag & one upper bag in each pannier. These bags are 1.5 inches bigger than the Imnaha, so pack the bag with a little room to spare, and it snugs into the Imnaha perfectly. Packing Tips Video. Note the upper bags for the Imnaha are pictured below and are different from the cube bags in the video. Happy Trails Imnaha Panniers are designed for riders who want the benefits of hard luggage without the extra bulk of larger aluminum panniers. They are lockable and sturdy. They present a very narrow profile and hold a surprising amount of gear when you pack right. Built with the same great quality as all other Happy Trails panniers for the true Adventure rider. A great addition to your pannier collection. The DL650 V-Strom SU rack has our new Point1 pressed insert design. This adds to the ease and functionality you?? ?ve come to expect from our pannier systems. Details HERE. The DL650 SU rack design fits the handy SU inner tool kit/utility shelf carrier. can't-leave-behind essentials, while leaving the panniers back at camp. The SU Rack system is compatible with the stock tail rack, and the Happy-Trail Tail Plate System.